Avocado Tuna Poke recipe: A restaurant quality dish that will thrill all who have it. Creamy avocado along with fresh sweet tuna, stirred together with sesame and soy. It’s healthy and delicious! 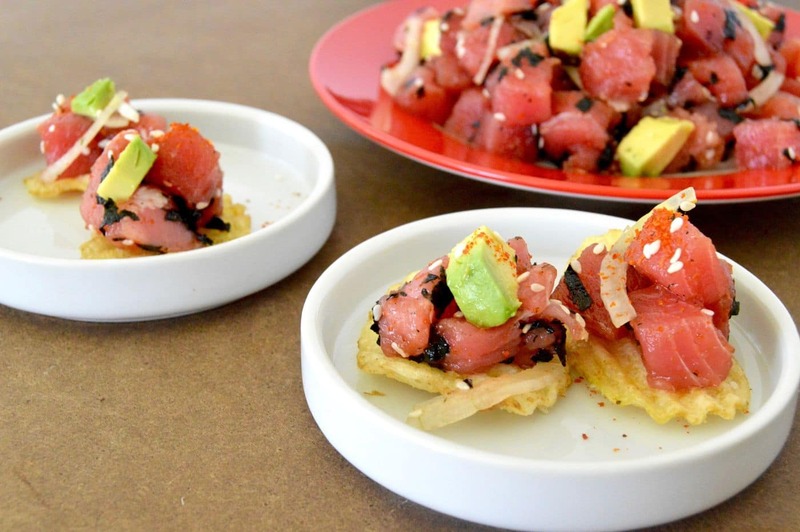 Avocado Tuna Poke is about as simple as it comes to having a sushi quality appetizer at home! I know, I just lost about half of you at the thought of raw fish? I get it, I really do. Until I met my husband I wasn’t a sushi lover either!? My idea of a good tuna dish was out of a can, slathered with lots of mayo in between two slices of bread. I must admit, the best thing I ever did when we went and tried sushi was to tell the sushi chef to not tell me what I was eating. I don’t know why, but if I didn’t know I was eating Octopus, sea urchin or eel at the time, it didn’t freak me out so much and I was able to judge/enjoy it solely on taste whether I liked what I was eating or not. I liked tuna. Correction, I LOVED tuna. When they handed me tuna it was a winner! …. its savory, yet sweet. The texture is firm, but melts in your mouth as you eat it. This recipe for Avocado tuna poke is a perfect way to highlight the tuna. It’s another recipe that I got from a class with Jet Tila. 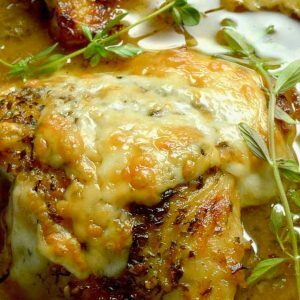 It has just a few ingredients, but when they meld together they just sing! 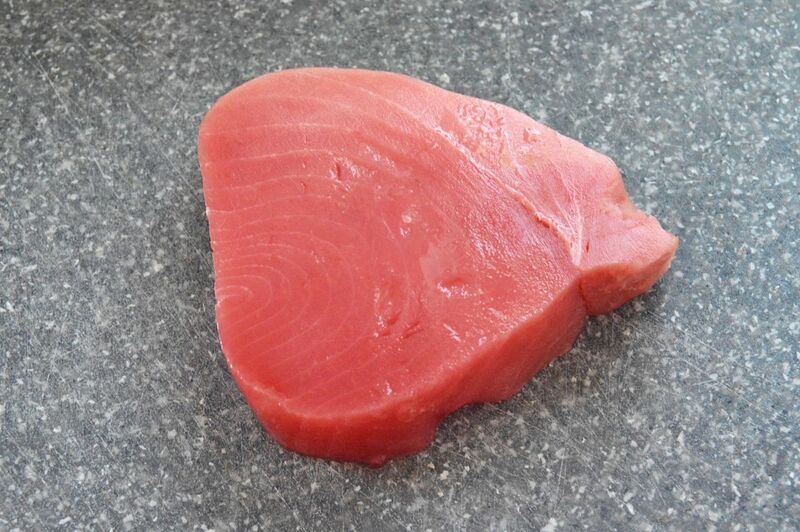 It’s easy to make, just be sure and purchase a sushi grade tuna to start with. Pictured here is ahi tuna. Sushi grade tuna is available at your local meat department, I purchased this at Whole Foods in my area, but in the past my local Costco has had it as well. It can be a little expensive, but when I serve this, I usually serve it on chips, fried wonton, or on lettuce wraps so the things that go with it are very inexpensive so it balances out. 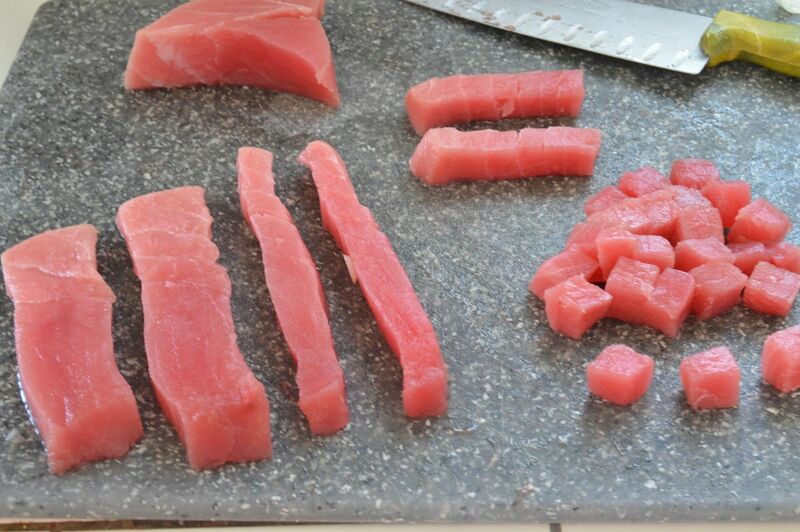 Here is an example of how I cut the tuna into the cubes. A little tip I’ve found over the years when cutting the tuna is to place the tuna in the freezer for about 15 minutes before I’m ready to work with it. Because the tuna is so soft, it tends to wiggle a lot when cutting and you can get uneven pieces. By placing it in the freezer it “gels” it a bit to allow for even cutting. Step By Step to Cut the Steak to Cubes! Easy/Hard: The hardest part of this recipe is cutting the cubes of tuna. If you follow my tip above it should be a breeze. However, even if your cubes are uneven, it will still taste Delicious! Make Ahead? It’s actually better if the tuna/soy/sesame oil have time to meld. You can make this recipe 8 hours ahead minus the nori and avocado. Stir the nori (seaweed) and avocado in at the last-minute. This way the Nori doesn’t get soggy and avocado won’t turn brown. If I’m serving this with fried wonton chips I make those in the morning at the same time I stir the Poke together! 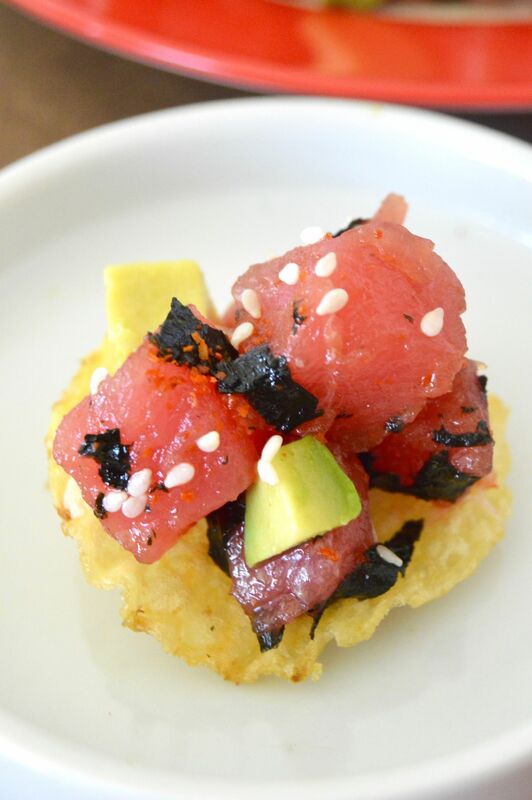 Serving suggestions: Serve the poke alone, or on top of thick cut potato chips. They also work great with wonton wrappers fried up quickly. 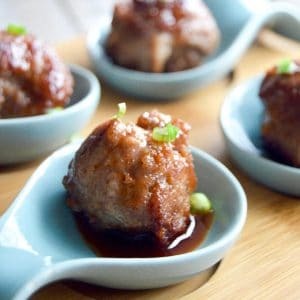 This could also be made if you are having a Tiki themed evening along with coconut shrimp and a mai-tai! Cocktail Recommendation: Serve these with an ice-cold beer, a Sakitini or a Hard Apple Bourbon! This also pairs well with any Saki (hot or cold)! 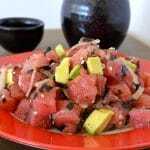 Avocado Tuna Poke recipe: A restaurant quality dish that will thrill all who have it. Creamy avocado along with fresh tuna, stirred together with sesame and soy. It's healthy and delicious! 2 ounces Thick cut potato Chips or Wonton crisps for serving. Combine all ingredients except Nori and avocado and stir to mix. 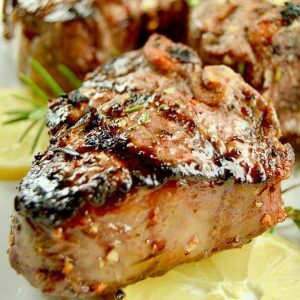 Allow to marinate for 30 minutes up to 8 hours. Right before serving, add in Nori and avocado. Place a spoonful on Chip, Wonton or anything you want to use as the"cracker." Alternatively you can serve this alone and eat with a spoon/fork. I love poke. The avocado and potato chips in this recipe make it my favorite version! I love it served on the thick cut potato chips! Genius! Thanks Laura~ It is really light so perfect for hot days! Served iced cold its perfect! I love avocado and this simple meal looks tasty for fish lovers. It is well presented too what a treat. I love all of these ingredients and these Pokes are so beautiful. I would feel badly for eating them since they are so lovely, but just for a second. This isn’t typically the kind of thing I’d eat (yeah, the raw seafood gets to me). BUT you’ve made this look really good! It’s tempting, for sure! I can tell my husband would totally be a fan! This looks so good Michelle! Can`t wait to give it a try! My husband would adore this! It looks really good. 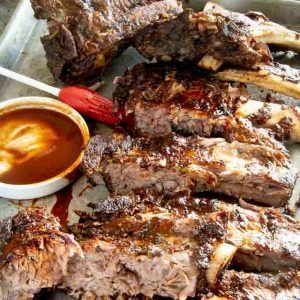 My husband was sooooo happy when I was working on this recipe…. It took a few adjustments in the development, but he enjoyed every single one! OH wow, that sounds delicious. I think my husband would really like this, so I will be trying it soon! Never heard of this appetizer before but it looks good. Will have to try it my family will like it I am sure. OH YES YES YES! THIS is one of my favorite pairings!! I added this recipe to my YumPrint cookbook. Can’t wait to try it out. Tuna is my favorite sushi and I love how the creaminess pairs perfectly with the avocado. I will definitely try out your tip of placing the tuna in the freezer to make cutting easier. I’m a huge fan of Susi too. I make it myself with the Maki and everything. Love this idea with the tuna. My daughter would LOVE this. She’s totally into sushi and she’s also vegetarian. IKEA has this tuna roll that she loves to get and so I’ll know she’ll try to make this. I am headed for sushi tomorrow night. I hope they have something like this on their menu! This is one of my all-time favorite dishes and you have taken the intimidation out of the preparation! I am in the south now and so it isn’t as easy to find as it once was, but I am now on a mission! Pinning this, too 🙂 . My oldest and I are allergic to avocados – can you imagine?! I bet my husband would really enjoy this dish, though.